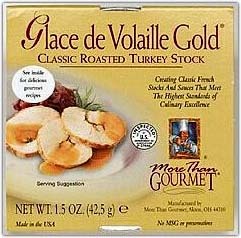 More Than Gourmet Glace de Volaille Gold - Glace de Volaille Gold, a classic roasted turkey stock, reduced 20 times, creates a deep, rich reduction resulting in a glace. The glace is perfect for creating unsurpassed, natural flavors for sauces, soups, stuffings & to create the perfect gravies! Glace de Volaille Gold is made in the U.S.A. using only the finest natural ingredients, no chemicals, preservatives, MSG or sugar. The 1.5 oz. container makes approximately 4 cups of turkey stock.